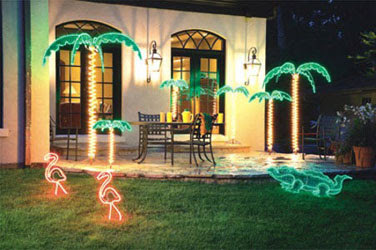 Lighted palm trees help you bring that "at the beach" feeling to wherever you are. Sitting by the pool while imagining that the palm trees were swaying in the breeze is a fantasy that's just in your reach. Okay, so they might now sway, but you will have the feeling of relaxation that only palm trees can bring. Lighted palm trees make a great poolside decoration and show off the ambiance of the pool at night. 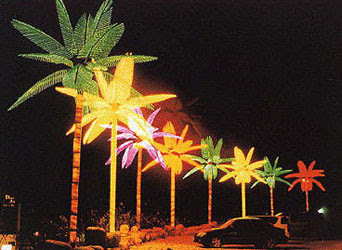 Commercial businesses can use lighted tiara palm trees for a look that will draw in hundreds at a time. You can't miss these bright and lovely trees staring down upon the streets. The tiara is one of the best selling outdoor palm trees with their large and sturdy structure. The way that lighted tiara palm tree can light up a parking lot is beneficial to being seen in general and being seen as someone with taste. 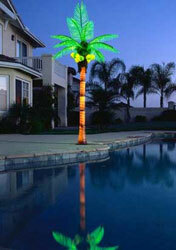 Tiara lighted palm trees are available in many colors and sizes so that every business or home can be perfected. Purple, orange, yellow, red, or traditional green can all compliment your landscaping or business theme perfectly. Lighted palm trees can create that warm feeling just about anywhere. You don't have to have a pool or be anywhere near water to feel the sun shining and warm weather feeling that a simple palm tree brings you. With sizes of light palm trees that are made with rope light ranging between 2.5' to 7', you can fill any space perfectly. With green fronds (leaves) with rope light lining, and a gold rope light wrapped around the trunks, these lighted palm trees are easy to assemble and very light weight so moving them is easy. Anywhere you can imagine sprucing up could use a lighted palm tree to pull the trick off. Feeling the warmth of the palm tree makes yards, poolsides, patios, and even balconies in apartments more relaxing. Taking in the beauty and simplicity of decorating with outdoor lighted palm trees is a no brainer!